This Season, Give The Gift Of Crystals! Yulia Van Doren shows us which gemstones make the perfect present for a variety of occasions and celebrations. ‘Tis the season! A birthday is a magical occasion in any person’s life, and also the perfect chance to give someone a crystal that’s filled with the highest spiritual energy and clarity. That’s where Spirit Quartz comes in. 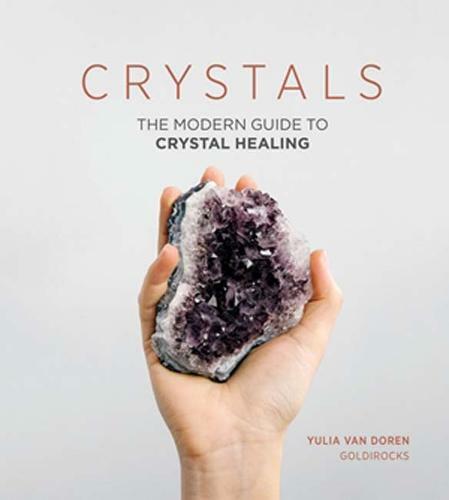 “Radiant Spirit Quartz is one of the most uplifting crystals in the crystal kingdom,” explains Yulia Van Doren, author of Crystals: The Modern Guide To Crystal Healing. “It will spread inspiration, healing and sparkles of joy wherever it is kept.” The day you were born may be an ideal time to access past lives, and Spirit Quartz can help do that, as meditating with it can also aid you getting in touch with your inner self and extrasensory perception. Whatever good news has blessed your life, there’s no need for the energy to stop there! One of Yulia’s favourite stones to gift someone as a congratulatory present is a piece of Pyrite. “Keep a cluster near and don’t say I didn’t tell you, as dream collaborations, creative inspirations and lucky breaks manifest with unstoppable abundance.” Be sure to leave a Pyrite cluster nearby to keep the newfound and positive vibes flowing through your life. A new home is the perfect chance for new beginnings, and your humble abode is somewhere that you’ll want to feel safe and protected in at all times. That’s why Yulia recommends Black Tourmaline as one of her new home essentials. “As an energy protector, Black Tourmaline is unparalleled,” she explains. “Think of this stone as a guard dog who tirelessly protects your personal boundaries and deflects negative energy.” We couldn’t agree more! She suggests placing a crystal near the entrance of your home, or a particular room to keep any negative forces at bay. A wedding day is one filled with love, hope, happiness and feminine energy. To feel like the beautiful love goddess that you are on your big day, Moonstone is one of the best gemstones to have, as it’s “deeply connected with the push and pull of feminine cycles, and is a soothing companion for when emotions and hormones are heightened”, explains Yulia. This iridescent stone on your wedding day will help awaken your inner femininity, spiritually connecting you to deities such as Venus and Aphrodite. Not only that, but this wonderful gem can also promote care and love in relationships, and is harnessed during new beginnings – everything you could want and more on your big day! Well done! You’ve managed to land yourself a brand new job. You start on Monday, and you’re wondering what crystal to take on your first day to keep on your desk. We suggest taking an Amethyst with you. “One of my essential rockstars, Amethyst is a truly miraculous crystal that blesses everyone within its wide energy field,” says Yulia. It’s a great gemstone to have if you want to give off those positive spiritual vibes on your first day in the office, and its striking purple hue will make for an interesting talking point with your new workmates. Wearing Amethyst can help also enhance your aura and give your self-esteem a quick boost, which might be needed if you’re feeling those first-day nerves! Yulia Van Doren is the author of Crystals (Quadrille, £9.99). Photography by Erika Raxworthy.